Click on Create Event to create your event. 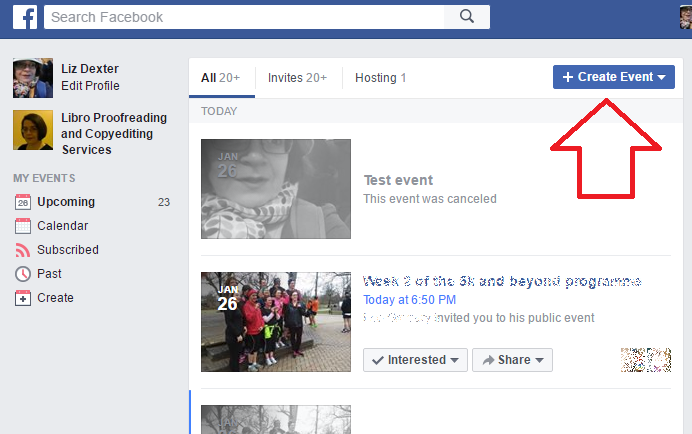 You will then have a choice: you can create a Private Event, which will be invisible to people unless you invite them (good for a party) or a Public Event that anyone can see and join up to (good if you’re promoting a charity event or running a public race, etc.). 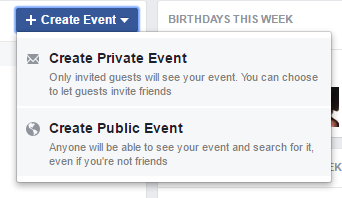 In this case, we’re clicking on Create Private Event. Here you can add a photo, add a location (Facebook allows you to choose from locations that already exist or you can just write in whatever you want to) and importantly add the date (click on the calendar, choose the date) and time (overtype the time). 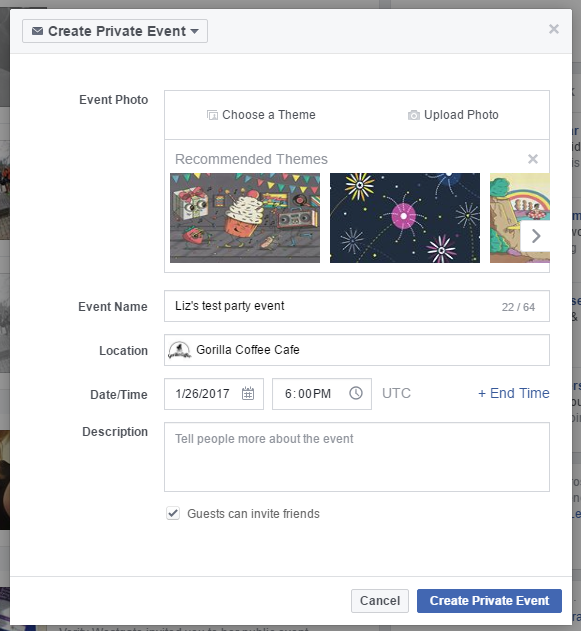 Decide whether you want guests to be able to invite their own friends (useful if you’re not Facebook friends with someone you want to invite but someone you know is) and then click Create Private Event. 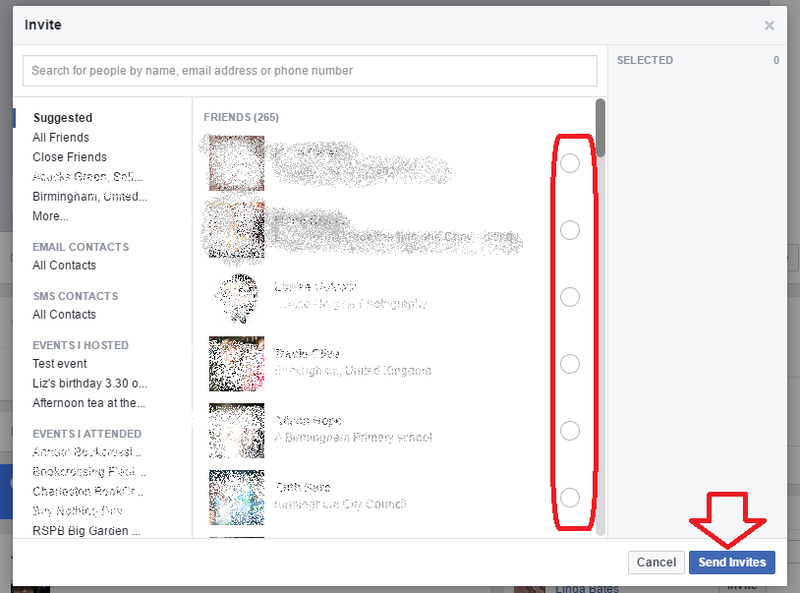 Now you can choose to invite Facebook friends or add email addresses (I’m not sure how this works as I’ve never done it – please comment below if you have!). Click on the button by the name to invite someone (the list will change if you select the groups of people on the left) and click Send Invites when you’ve finished. This will then send invitations to all guests. How they receive these depends on how they have set their notifications, by the way. How do I know who is attending my event? Here I can see that two people are going, and their faces appear in the right hand area. 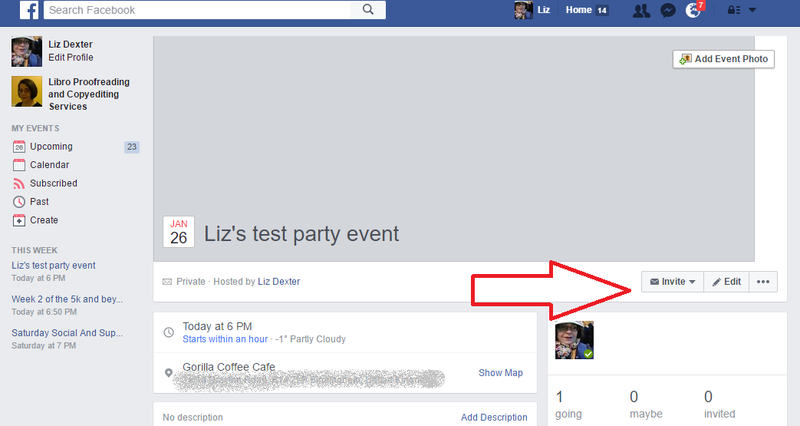 This article has explained how to set up a Facebook event, invite people and see who is attending. I have continued to write about editing, communicating with attendees and deleting events. 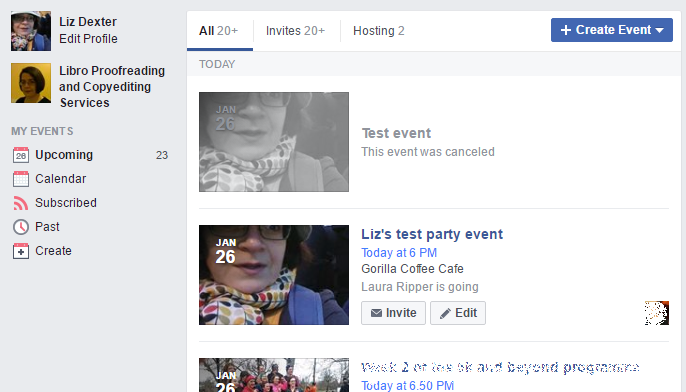 How do I communicate with the attendees of my Facebook event? Welcome to my own Small Business Chat update. My participants tell me they find it useful to reflect on the past year and plan ahead, and I’m no different. And today it’s my birthday, so it seemed apt to do this now. I started interviewing myself back in December 2011, then December 2012, December 2013, a December 2014 and January 2016. Last year, these were my plans for the year: “I’m going to be reading more because I started to make more time for reading over Christmas and I’m continuing with that. I’m going to keep running a half-marathon distance or more a month, and hopefully (very carefully and slowly) running a marathon later on in the year. I’m going to complete the self-mentoring for editors guide and produce a print and e-book version by the middle of 2016. I might write up my research or I might not!” Did I achieve these? Um, partly. Oops! But I’m no different from my other interviewees there. Reading more: Yes, I read 11 more books in 2016 than in 2015 and I read more non-fiction (not a goal, but I like reading non-fiction. I did a report on the year as well as a top ten reads list here. I had more time for reading because I adjusted how I was working; see below. Running: I continued running half-marathon distances until the Easter, when I had an epic fall (over a dog: not funny yet, I’m allowing it to be funny from next Easter), cracked and bruised my ribs and had to eschew running (and moving, sleeping on one side, coughing, laughing) for a bit. HOWEVER, I did fight my way back to some form of fitness, and completed my first marathon in Iceland in 6 hours 1 minute (race report here). Writing: I did not complete the self-mentoring for editors guide or produce any versions of it in book form. I did add to what I had already and it will be done. Research: I have nearly but not quite finished writing up my Iris Murdoch research. So it looks like I completed more of my personal than work goals, and that’s fine! I continued to make sure that I took more time off, and this had an impact on what I was able to do with the writing. I now take most weekends off, or at least 1.5 days of each weekend; I might have the odd bit to do. The balance of my work has changed: I’ve always worked with writers and journalists and had worked on transcribing the interviews for a couple of books, but this last year I’ve worked a lot more for ghostwriters on big projects. I have had repeat projects from some clients and been recommended on within the ghostwriting community. This is great as it’s large projects with reasonable flexibility and interesting work: you really get to know the subjects of the books, and also having a lot of tapes of one person means you can build a glossary for them, spend less time looking things up and get more done (and more earned) in the average hour. I’ve also continued to work on more in-depth and longer academic projects in transcribing, which again is good from the point of view of economies of scale. I have continued to keep a good mix of academic, journalist and corporate work. My clients are constantly amazed at how much I “know” – which is mainly looked up, of course! My editing work has stayed constant, working with translators, non-fiction writers, etc. I have moved away from any fiction editing except for a couple of regulars, as I prefer working on non-fiction. My localisation work has diminished; I’m not sure why and it hasn’t had the effect on my income that I feared, as I’ve balanced it with corporate transcription. In my personal life, I’ve qualified as a Leader in Running Fitness which means I am doing more volunteering in my running club, which I love! It’s great to have the theory behind the practice and the practical tips from the course at my disposal. It sounds really arrogant to say you haven’t learned anything. I’ve continued to know that I am supported by a community of colleagues; I have kept up with saying no, and every year I re-learn to trust my gut instinct and that sometimes you do end up pulling a late night to get something done. Be clear on what you’re offering people. As economic and political times don’t seem to improve, competition can become more fierce. Be clear what you’re offering to a prospect, but do not allow people to play you off against your colleagues. Keep a good spread of customer types and regions, etc. to try to protect yourself against economic shocks. Make time for mental health, whether that’s running, reading, colouring in or sitting around blankly staring into space. If you need it, do it. I will still be running, I will have done the Birmingham Marathon and I will have supported running club mates through the training, too. I will have volunteered at parkrun or junior parkrun 100 times (you don’t get a special t-shirt for that but it’s so cool to say you’ve done it. I will have continued to maintain a good work-life balance and have most weekends fully off. I will continue to work as transcriber to the ghostwriter stars and will see lots of my books on the shelves but often not be able to point them out as I’m not allowed to talk about them! I will have written up my research such that I can provide a copy to people who want it at the Iris Murdoch conference in September. Hello again, Amelia, we’ve spoken during the year but let’s get started on your exciting update. Are you where you thought you’d be when you looked forward a year ago? Yes and no – I guess that’s always the way! My business looks a lot different this year (intentionally), and I’ve ticked off a lot of goals: I’ve streamlined the behind-the-scenes which makes the day-to-day running of the business a much smoother process, and I’ve also carved out time for the more creative pursuits I had in mind at the end of last year. Some things I feel a bit behind on, but I think it’s an occupational hazard of business owners to beat ourselves up over the things we didn’t get done instead of celebrating all that we did. Overall, I’m really happy with where I am, what I’ve done, and what’s in store for this year. I completely overhauled my branding, my business name, and my website, because my old branding didn’t reflect where I am with my business anymore. I’m glad there was a need to do that (however long and complicated the process!) because it shows how much things have grown and developed since I started two years ago. I’ve put a lot of work into developing my first product, a course, and I’ve put an emphasis on connecting with other business owners and making new friendships. I’ve started blogging consistently and sending out a newsletter, to really build a community with the people I serve. I’ve also been working hard to increase my revenue streams, and successfully experimented with affiliate marketing, which is something entirely new to me. The things that have stayed the same are my core services and the fact that I’m still totally in love with what I get to do every day! My big investment this year was a conference for female online business owners. I shared what I learned from that in a blog post, but the longer I’ve been doing this and the more entrepreneurs I meet, the biggest thing I’m learning is that we’re really all in it together. The people we admire and look up to are facing the same challenges that we are, and you can’t overestimate the importance of community and support as you continue to grow. I completely agree; as I’ve said many times, cooperation is more important than competition! Any more hints and tips for people? Be fluid and open to change. My business and my brand looks an awfully lot different than it did last year, and while it’s not perfect, and it took (and takes) a lot of work, it was the absolute right move to set me up for success going forward. If you wake up one day and think something could be better or different in your business, don’t let the complications of making the change stop you from adapting. Have you got a community or friendship circle made up of other people in business? Where did you meet them and how much of an impact do those relationships make? My course will have launched! I hope to have increased and diversified my revenue streams, and to have continued to grow my audience via my blog and newsletter. Finally, if any of your contact info, websites etc. have changed since last time, please give me your new links. All change! My website is The Editing Shop and you can find me on Twitter @editingshop. 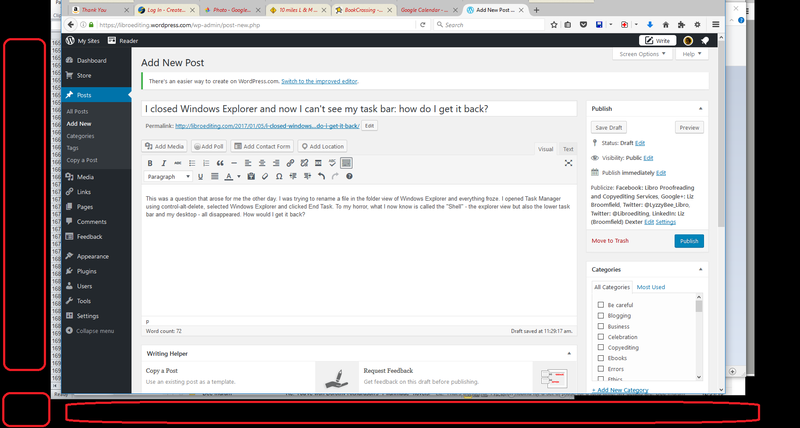 I closed Windows Explorer and now I can’t see my task bar: how do I get it back? This was a question that arose for me the other day. I was trying to rename a file in the folder view of Windows Explorer and everything froze. 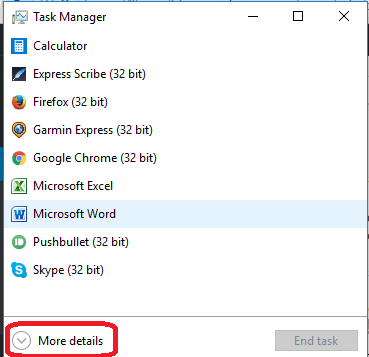 I opened Task Manager (see my article on Task Manager if this is new to you) using control-alt-delete, selected Windows Explorer and clicked End Task. To my horror, what I now know is called the “Shell” – the explorer view but also the lower task bar and my desktop, the clock, the Windows button – all disappeared. How would I get it back? My poor sad monitor view with no desktop, Windows button, bottom task bar, clock, etc. How do I restore a closed app using Task Manager? Just as you can use Task Manager to close an app or piece of software that’s frozen, you can use it to restore, too. 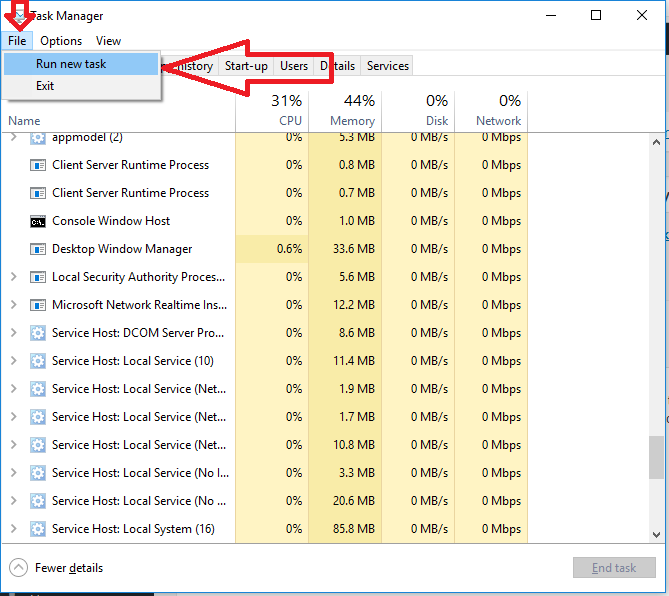 Open Task Manager using the Start button or Control-Alt-Delete and click the File tab (note, this is Windows 10, so yours might look a bit different, but it will have the same features that we’re talking about here). 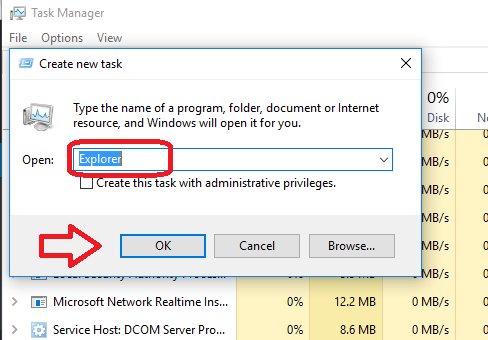 Type “Explorer” (or whatever else you can’t find) in the Open field and then press OK (Don’t worry about the admin privileges bit at the moment: you would know if you needed to use that). In this article, I’ve shown you how to make Windows Explorer (or any other app or software you have made disappear) reappear when you’ve accidentally closed Windows Explorer and your desktop icons and task bar have disappeared. Today we’re catching up with my old personal trainer, Marvin Edinborough, or Marvelous PT. He started taking part in this series in July 2012 and checked in for an update in August 2013, October 2014 and December 2015, Especially as I’ve been involved with supporting beginners and other runners in my running club and qualified as a Leader in Running Fitness, I’ve thought of Marvin’s excellent Emotional Intelligence and the way in which he tailors his training to how his clients work and are motivated – and there’s a lesson there for all of us in adapting to how our clients need to be interacted with. Around this time last year, when asked where he wanted to be by now, Marvin replied “I aim to be working towards my life goal of running my own qualifications company. At the moment it’s just ideas, but over the next few years I’d like there to be some sort of development. I’ll still be personal training of course. No matter how busy I get I will find time to personal train, as it’s something I have enjoyed for 6 years now”. Let’s see how he’s getting on. Hello, Marvin. It’s great to have you back! Are you where you thought you’d be when you looked forward a year ago? Yes, definitely. Currently I am still tutoring on fitness courses, both delivering full-time courses and meeting with learners who are studying online for practical tutoring days. It’s going great and I believe I am slowly but surely making a difference to the industry with the personal trainers I am putting through. Well I am still tutoring, the change has been I am now travelling and meeting with learners all over the Midlands, interacting with and training people from all different backgrounds and walks of life. One by one I am affecting learners across the West Midlands, enabling them to succeed in what is a very competitive industry. In the past year I’ve done a lot of re-learning if you like, going back to when I sat my own personal training qualification and covering modules you probably wouldn’t use in everyday training. I also, as stated, wish I knew the requirements to provide these types of qualifications independently, as this is something I intend on doing going forward. Take the leap. Go for it. Whatever “IT” may be. That is something I intend to do this year, my aim is to have started my own company, providing qualifications by August. What has stopped me so far is my ability to do the above. My question would be on a personal level! Business owners who have “made the leap” if applicable: How do you juggle the hustle and bustle of running a business, tending to a toddler, whilst working and still having time to workout!!!?? In a year from now I hope to be running my own qualifications company, and for this to be established (Marvelous Qualifications, maybe?) producing high-quality professionals. I love that a man’s asking questions about fitting in work and childcare – so often it’s only women who are asked about this! Any tips for Marvin? I’m glad he’s on the case of training personal trainers, as there are some very shoddy courses around but he has the credentials and attitude to teach people the right way. Let’s hope he has that qualifications company going by the next time we talk to him! You can contact Marvin via Facebook, Twitter or email.